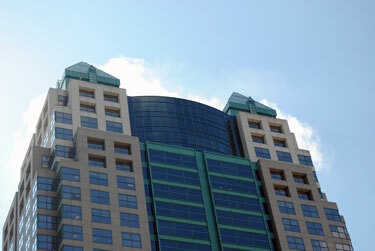 Within the urban skyline landscape of Orlando, Florida, four 35' high x 35' square fiberglass turrets flank one another atop the SunTrust Bank Building, providing Orlando’s tallest building with an architecturally inspired spire crown. Originally conceived over 30 years ago as steel and aluminum decorations, the fiberglass turrets of EXTREN® structural shapes and FIBREBOLT® fiberglass studs and nuts housed 20' high antennae for first responders’ communication. 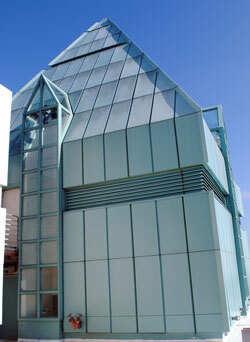 As an industry leader, Strongwell’s fiberglass structural products comprehensively gained L.A.R.R. approval. This certification allowed the developer to alter the metallic design to composites due to composites transparency to radio signals. a 10' high x 5' wide window. 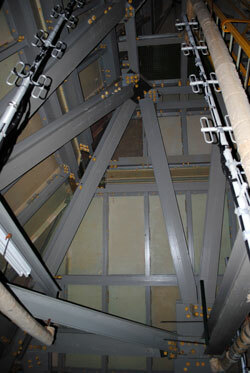 Each fiberglass superstructure is covered in custom molded fiberglass panels. Owens, Skidmore & Merill to accommodate hurricane winds common in Florida. the antennae to be installed because the 441' height of the building would have interfered with critical radio signals. the tightness of bolts every few years or after significant weather events.